Why Build a Basement Wine Cellar? Storing wine commercially – in bond or otherwise – isn’t cheap, and if you are not storing for investment purposes it can be quite awkward, as retrieving the odd case or bottle often incurs charges and is a barrier in itself to enjoying your wine. However, it is essential that wine is stored in optimal conditions, and this is where OLBC can help you. Wine cellars divide into two broad types: active and passive. A passive wine cellar is the traditional wine cellar: the same as the original producer will have used. Passive cellars use the ground temperature to regulate the cellar, as deep down the ground temperature doesn’t change much. The advantages of a passive wine cellar are that there are no ongoing running costs and there is no air conditioning to service. However, they do need more careful design with regard to potential points of heat transfer, and how the cold surface of the surrounding ground is going to connect to the cellar volume without introducing uncontrolled humidity. It is usually necessary to have some degree of humidification in domestic passive cellars to stop corks drying out and decelerate ullage. Active wine cellars are more common in basement conversions. They are quite simply a well-insulated room with a special chiller unit fitted. Because of their suitability within basement conversions they are frequently designed with an insulated glass wall separating them from a cinema room or media room, with joinery grade racking and bespoke LED lighting. These feature wine cellars are the perfect combination of excellent storage conditions and constant access, and are a stunning visual addition to a basement conversion. Read more about types of wine racking below. 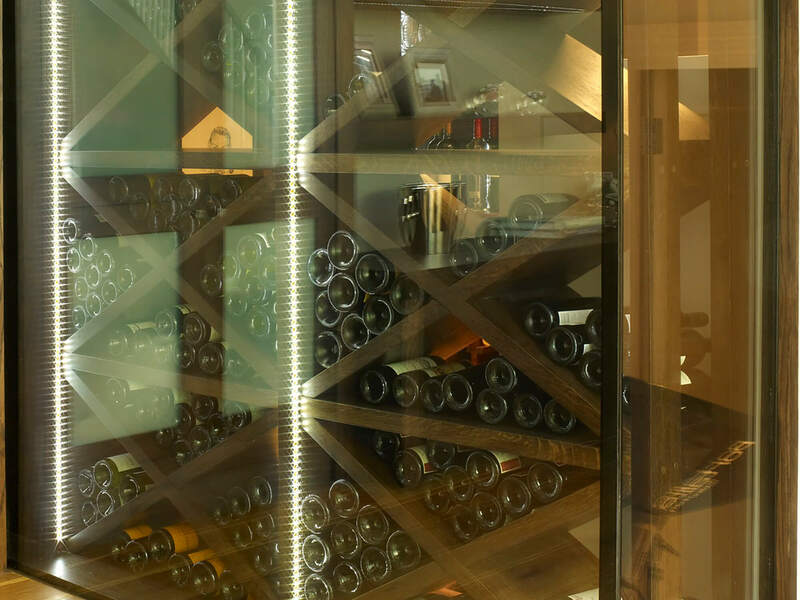 Wood – The majority of our clients have bespoke joinery grade timber racking catering for box storage, bin storage and individual bottle storage according to predicted bottle type. Glass – Bonded glass shelves are a real design and display statement. A lot of our clients have a double glazed viewing wall into the cellar too. 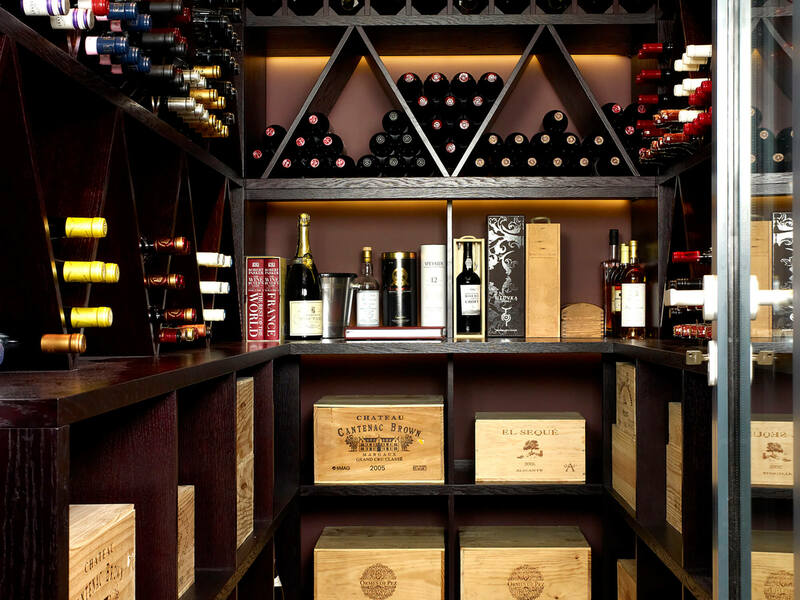 Metal Display – Metal can be very effective for display racks in the wine cellar. Metal Utility – An excellent utility solution for a really large wine cellar or if you have a back room to your wine cellar for large stocks of every day drinking wine or wines that are just not ready. Metal utility racking used in this way can be very cost effective and quick to construct. Stone – York stone shelving is a traditional solution and looks magnificent. It adds thermal mass, as the stone is heavy, as well as humidity stabilising effects, as it is porous. Concrete – Popular in Europe, concrete stacking systems are ideal for large areas where an industrial look is required, and also for use in passive wine cellars (such as the winemaker’s cave) as their thermal mass helps to preserve the temperature around the bottles. They do however take up a lot of space and are probably not ideal for modest basement wine rooms.